The Brighton: A “high-energy” waterfront pub by the Hilton brothers, who are known for places such as The Gibson at 14th and U streets NW and Chez Billy Sud in Georgetown. Pearl Street Warehouse: A small-format, live music venue and tavern on Pearl Street, an east-west alley running parallel to Maine Avenue by Nick Fontana, Bruce Gates and Henry Gandy, the owners of Cantina Marina. Kaliwa: An Asian fusion restaurant on Pearl Street with Filipino, Thai, and Korean cuisine by Cathal Armstrong. A yet-to-be-named Indian concept by chef K.N. Vinod and Surfy Rahman, who operates Indique and Bombay Bistro. These are in addition to the other restaurants and retailers announced in recent months. So far, there are 16 confirmed retail tenants. Needless to say, these new dining options will vastly change the restaurant scene in Southwest! 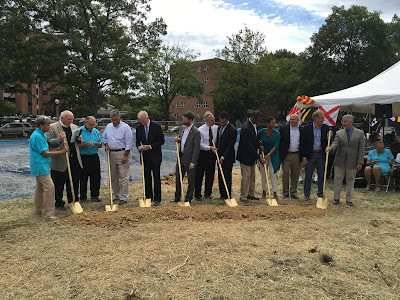 On Sunday, September 11, community leaders, members from St. Matthew’s Lutheran Church, project developers, and the community at-large gathered at a lot on the corner of M Street and Delaware Avenue for a groundbreaking ceremony. The groundbreaking ceremony was for a new St. Matthew’s Lutheran Church. Speakers at the event included Pastor Philip Huber of St. Matthew’s, Ward 6 Council member Charles Allen, Ward 2 Council member Jack Evans, and Chris Roth from Trammell Crow, one of the developer partners in the deal. 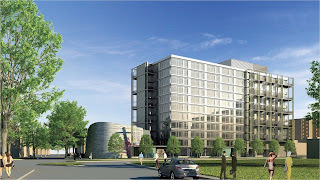 In designing the project, architecture firm Shalom Baranes Associates placed the apartment building on the west side of the site and the church at the corner of Delaware Avenue and M Street, in order to preserve what is left of the view shed along Delaware Avenue north to the Capitol dome. 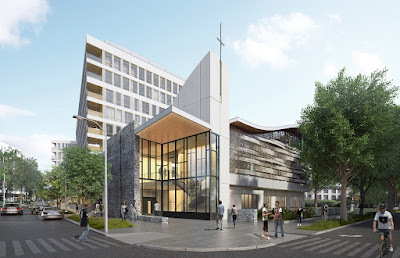 The new St. Matthew's will be constructed with stacked stone masonry and colored glass will be inset using cut glass from the old church building that will form an image - perhaps an image of the giving of the Holy Spirit. Glass will be back-lit so it will be illuminated at night. The square immediately to the right of the base of the cross on the M Street façade is a large window that will allow people to see into the sanctuary, look through to the baptistery, and into the courtyard in the back. Architecturally it conveys that St. Matthew’s is open to the community and welcomes everyone to venture inside. The sidewalk will have an indenture at the window with a backless bench, so people can "sit a while" and rest while looking into the interior space. The green panel to the right of the window (and left of the door) is the exterior wall of the sacristy and is where the name of the church will be located. There will be 10,000 SF of community space and meeting rooms, as well as the Thurgood & Cecilia Marshall Southwest DC Community Center and Sacred Grounds Cafe. Meanwhile, the apartment building is shaped like the letter L, with an 11-story building fronting M Street and an 8-story building on the west side perpendicular to M Street. Approximately 220 residences are planned, with 10% set aside under inclusionary zoning as affordable housing. The apartments are not affiliated with St. Matthew's, so anyone can apply to rent a unit. 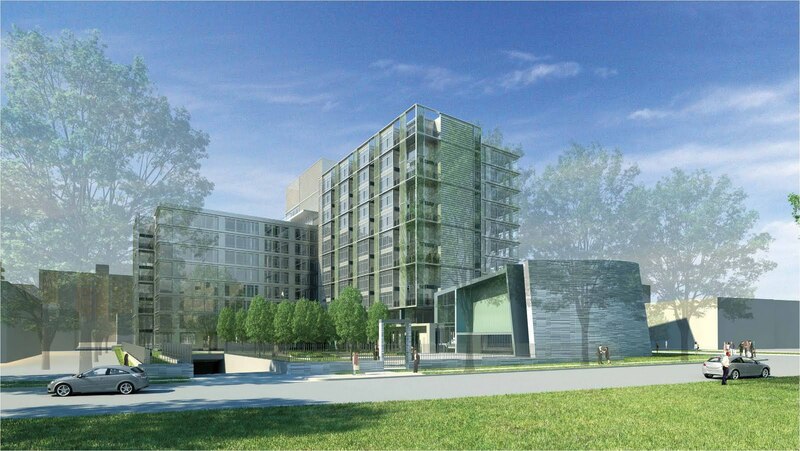 There will be metal cladding on the apartment building along with two-story metal panels. 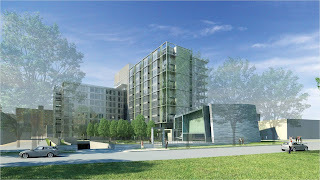 Design cues for the building were taken from neighboring residences like River Park and Waterfront Tower, and the incorporation of a courtyard was done to fit in with the Southwest building style of having apartments frame courtyards. Approximately six private patios will be on the ground level for tenants. 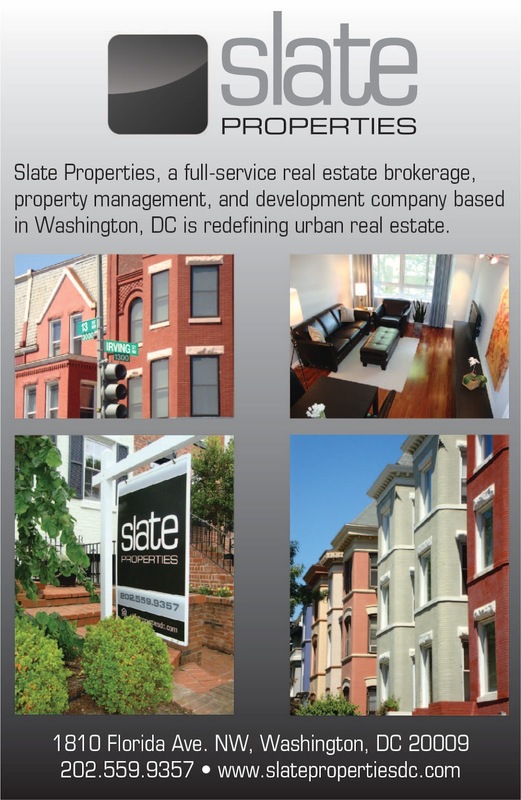 Other apartment amenities include a fitness center, lounge, screening room, and two levels of below-grade parking. Local landscape architectural firm Oculus has designed the courtyard - the same firm that designed the Waterfront Station Metro plaza. The courtyard area will be shared between the church and apartment building with a seating area and a shallow pool that will be connected to the fellowship hall of the church. There will be a bosque of trees in the center of the courtyard and a paved area in front, facing Delaware Avenue. A landscaped buffer will be installed along Delaware Avenue to shield the outdoor space and provide some security. The existing trees on the site will be maintained on three sides, including along Delaware Avenue, the western border with 240 M Street, and on the south. New landscaping will be planted on M Street. Parking will be accessed via Delaware Avenue and loading will be done on M Street. All main pedestrian entrances (for the church, community center, and apartment building) will be on M Street. It will take about two years to build the project. Construction completion is expected before the end of 2018. Fundraising is underway for the memorial with the goal of dedicating it on the 75th anniversary of D-Day, June 6, 2019. Back in 2015, a PUD filed for Parcel 1 and the area in and around the Municipal Fish Market mentioned space for a market hall with an “Italian butcher/deli and large market hall/restaurant.” Now we know who will operate the market hall space. It was announced that Nick Stefanelli, which opened Masseria at Union Market in NE last year, will operate the Italian market at The Wharf. The planned three-story building along Maine Avenue will contain nearly 12,000 SF of space, as well as a 5,600 SF private roof deck. 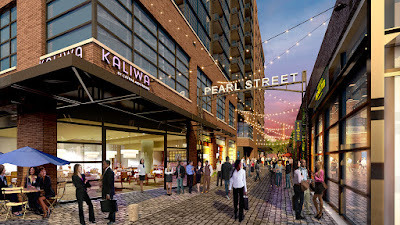 In addition to the roof deck, the concept includes an artisanal Italian Market with a salumeria, cheese cave, and butcher shop, among other things, and a trattoria on the second floor with an exclusive 12-seat table in the wine cellar. Stefanelli's market hall is scheduled to open by the spring of 2018, a few months after the first phase of The Wharf is expected to deliver. A demolition permit application was filed last month for Riverside Baptist Church, located at 6th Street and Maine Avenue. 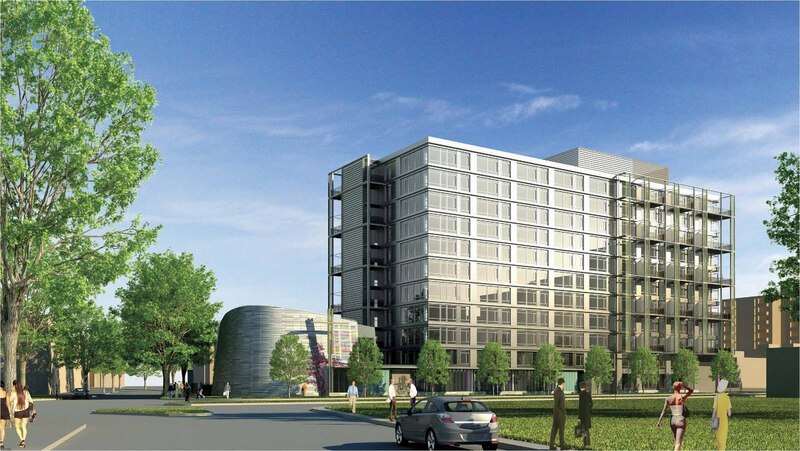 Back in March, the Zoning Commission approved the PUD for the site, which will be redeveloped with a new Riverside Baptist Church and a 173-unit apartment building. The church’s location will shift south to the intersection of 6th Street and Maine Avenue while the apartment building will be located at 6th and I streets. About 10% of the apartment units will be set aside as affordable housing for households earning up to 50%, 80% and 100% of Area Median Income. There will be space on the ground floor of the apartment building for community-serving uses, such as a daycare center. Construction on the project is expected to start before the end of the year with completion in 2018.